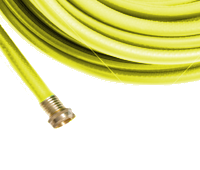 The durable and reliable construction of the Armstrong Thermoplastic Polymer Hose makes all of your watering needs easier than ever. 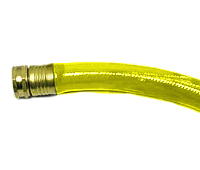 The Thermoplastic Polymer hose used in our industrial hose products and now offered in a garden hose variety of colors and lengths offers a lighter weight with higher durability than the typical rubber or vinyl hose. The added strength and flexibility also offer maximum kink resistance in even sub-freezing conditions. Brass couplings with built-in washers provide leak-proof water flow, while the exterior surface is treated to resist stains, mold growth and surface abrasions with a burst strength rating of over 1000 PSI. 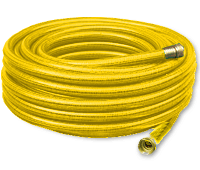 Use Armstrong Garden Hose for your watering needs and enjoy a hose that will last a lifetime. Made in the USA. Lifetime replacement policy.